The NBCC Foundation has awarded Onyema Okorie of Fresno, California, a 2014 military scholarship. The NBCC Foundation, an affiliate of the National Board for Certified Counselors, Inc. (NBCC), recently awarded a 2014 NBCC Foundation military scholarship to Capt. Onyema Okorie of Fresno, California. The military scholarship is awarded to service members, veterans and spouses pursuing a counseling education who commit to serving fellow military personnel, veterans and families upon graduation. As one of six 2014 military scholarship recipients, Capt. 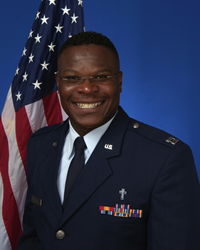 Okorie will receive $5,000 to support his counseling education and facilitate his service to military populations. Capt. Okorie is a graduate of Seat of Wisdom Seminary and is pursuing a master’s degree in mental health counseling with Capella University. He is currently serving as a military chaplain of the U.S. Air Force and is stationed at Kadena Air Base on the island of Okinawa, Japan. He is the assigned chaplain to his installation’s medical facility, a responsibility that includes serving as the chaplain-representative to the Victim Witness Assistance Program, Sexual Assault Response Team and Traumatic Stress Response Team. Capt. Okorie is a veteran of multiple deployments to Operation Enduring Freedom (Afghanistan) and Operation Iraqi Freedom.